Wireless technology can be used to predict deterioration in the health of children, potentially saving thousands of young lives, according to the organisers of a new study. The RAPID (Real-Time Adaptive & Predictive Indicator of Deterioration) project is using biotelemetry and the wireless sensors (Patient Status Engine, Isansys Lifecare) to collect real-time data on vital signs such as heart rate, breathing rate and oxygen levels. This data is then analysed to predict when a child’s condition may be deteriorating, providing an early warning system that can be acted on immediately. The project is jointly funded by the Wellcome Trust and the Department of Health, through the Health Innovation Challenge Fund, and is on plan to have recruited over 500 patients by April next year and 1,200 patients over the three year lifetime of the project. The new RAPID technology enables continuous monitoring and analysis of large amounts of data in real time. New care pathways enabled by these new technologies need to be evaluated to establish the clinical and quality outcomes as well as the costs and value for money, say the authors. The University of Birmingham will be doing the Health Economic analysis and providing the biostatistical support for the study. 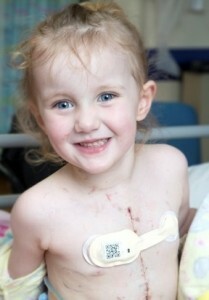 Four-year-old Maci Walford was the first patient to be monitored in the project, which has the potential to revolutionise hospital care. In the case of Maci, who has a congenital heart condition, a set of small wireless sensors were attached to her chest and ankle to measure her vital signs continuously. A paediatric cardiac sensor was used to collect data directly from the child, analysing the ECG of every heartbeat to provide continuous readings of heart rate, respiration rate, and heart rate variability.